A gun dog at heart, the English Setter was bred for hunting birds. Many unique dog names can be taken from well-known hunters. Boone, Cody, and Capen are just a few examples. The breed is more commonly named after hunting related products than actual hunters. English Setters named after guns, ammo, or knives are typical. Some ammo related dog names include Remington, Winchester, Glock, Colt, and Bellot. Smith, Wesson, Derringer, Browning, and Dakota are potential names that come from gun manufacturers. Buck, Kershaw, and Rothco are names taken from popular brands of knives. On the non-hunting side of things, many English Setter owners choose an English dog name true to the breed's roots. Among the more common English dog names are Charles, Gabriel, and Abigail. Other interesting names are taken from counties in England like Devon, Cornwall, Bristol, London, Cumbria, and Durham. Some of our pages will contain a subcategory. A subcategory is a slightly more specific grouping than the main topic of the page. For a subcategory, we will include a separated table of names and corresponding descriptions. An example of a subcategory of Red Dog Names would be 'Dog Names Inspired by Red Wines'. 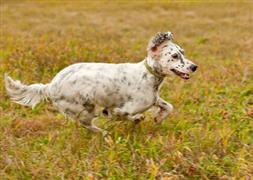 If you have any subcategory ideas for the English Setter Names page, we would love to hear them. Use the form below to submit your ideas.